Head sommelier Michel Couvreux glances up at a large flat-screen television hanging from the white-tiled walls in the kitchen at Per Se. The television streams live footage of cooks in starched chef jackets and blue aprons, prepping for dinner service at the renowned French Laundry in Napa Valley. "There are our friends," nods Couvreux. Both restaurants are owned by chef Thomas Keller and, despite different settings (one a wine country farmhouse, the other a Manhattan skyscraper), they could almost be twins. They have matching blue front doors and similar tasting menus; both have received three stars, the top rating, from the French restaurant guide Michelin. 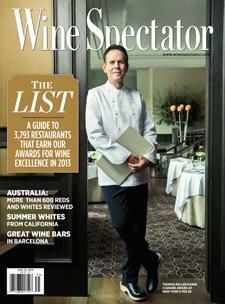 The French Laundry earned Wine Spectator's Grand Award in 2007. Now Per Se too has reached that summit. Per Se, which opened in 2004, overlooks Columbus Circle at the intersection of Central Park South and Broadway, where sparkling skyline meets cherry blossoms each spring. At the restaurant's 16 tables, arranged in an amphitheater fashion, guests sit down to enjoy one of the best views in the city and an equally impressive nine-course tasting menu, prepared daily by chef de cuisine Eli Kaimeh. In the four years since Couvreux joined the restaurant, the wine list has grown from 1,300 wines to more than 2,300, to better complement the sophisticated menu. Employing an iPad wine list, guests can browse or search a collection that's focused on Old World classics from Burgundy and Bordeaux. "Our food at Per Se is very delicate, and I think white and red Burgundy go well with the cuisine," says Couvreux. "And I'm also French and love my Burgundy wine too!" The nine-course menu ($295 per person, service included) traditionally begins with Keller's signature salmon cornet and ends with a cheese course, two desserts and a finale of truffles, macarons and shortbread cookies. (A vegetarian menu is also offered.) Two sommeliers man the dining room each night, and they are apt at finding a bottle or glass of wine to accommodate any dish or personal preference. "If you ask for a glass of Grand Cru Chablis, we'll open it," says Couvreux. Whites are a popular pairing for the menu's two seafood courses, which one spring night featured bacon-wrapped Atlantic monkfish and butter-poached Nova Scotia lobster. The list covers Burgundy's major appellations well, with names like Raveneau, Coche-Dury, Lafon, Leflaive and Niellon. There are also more than 100 grands crus bottlings, running the gamut from Bonneau du Martray Corton-Charlemagne 2006 ($485) to Ramonet Montrachet 1986 ($5,655). The red Burgundy selection is even deeper, with plenty of choices to bridge the menu's transition to its two meat courses. Ten vintages of Armand Rousseau Chambertin reach back to the 1993 ($6,400). Georges Roumier Bonnes Mares is also 10 vintages deep, to 1966 ($6,825). There are 44 different bottlings from Domaine de la Romanée-Conti, including a 1978 La Tâche ($12,850). But mature Bordeaux is the classic pairing for the spring lamb chop—presented with artichokes, pickled peppers, charred eggplant aioli and a niçoise olive jus—served on my recent visit. There are more than a dozen choices from 1982, including Château Léoville Las Cases ($1,740). Overall, the 200-plus Bordeaux selections span more than a century, ranging from Château Cantemerle Haut-Médoc 2009 ($185) back to Château Margaux 1900 ($18,000). The cellar also embraces California, the Rhône and Italy, with notable verticals from Bryant, Colgin, Harlan and Guigal. And there are attractive options from lesser-known regions, where top picks include F.X. Pichler Grüner Veltliner Smaragd Trocken Wachau Dürnsteiner Kellerberg 2011 ($255) and Domaine Tempier Bandol La Migoua 2006 ($255). For those who want just a taste of Per Se, the restaurant's salon serves a small-plate à la carte menu. The dishes are delicious, such as quail breast with morels and English peas ($38), but it's like being served just a sip of a rare wine. Once inside Keller's majestic blue doors, it's best to embrace the full experience and enjoy a special evening in which one of the world's top chefs presents his stunning cuisine accompanied by a collection of the world's greatest wines.